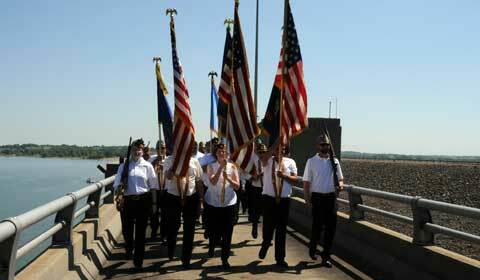 Members of Legion posts countywide, join together for a Memorial Day ceremony on the Pomona Dam tower. 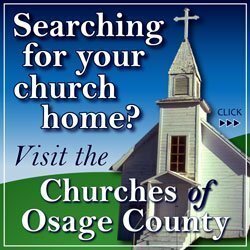 Osage County is full of military traditions and customs. The best part is young families beginning their own traditions, and honoring old traditions being handed down through generations. 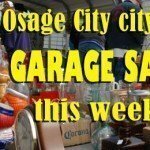 Memorial Day is full of old traditions and honor, especially when it comes to the local legions posts. Through the years, new people ensure these traditions carry on. Brandon Smith, left, welcomes Lt. Col. Ret. Sam Newland, who provided the prayer at Lyndon and Vassar Memorial Day ceremonies. In the Lyndon area, the Smith family, with two younger girls and a boy (Jesina, Grady, Peyton), continue a tradition from another family in American Legion Post 125. Brandon Smith is the vice commander of the Sons of the Legion Post 125. 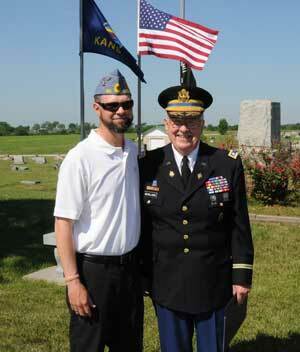 He volunteered, with his young family, to take over with the tradition of putting up flags for veterans. They went to three area cemeteries Friday. This is a tradition he wants to continue in the future for his family to show gratitude. In Burlingame is the Diver family with their young daughter. Aaron Diver and his father are both marine veterans. He brought his daughter, Adisyn, to Burlingame Cemetary to place flags with their community. This was his way to show her the meaning of Memorial Day and the sacrifices not just her family made but that of other people. Post 125 has a tradition of putting up the flags at Lyndon and Vassar cemeteries. The traditions have been with this post for more than 40 years. They put the flags up and remove them each day from Saturday through Monday. Monday, Memorial Day, usually around 10, they start their flag presentations at Lyndon Cemetery. At this week’s ceremonies, Lt. Col. Ret. 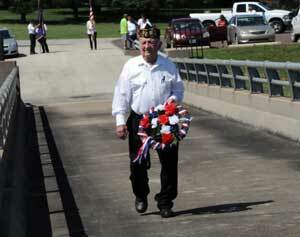 Sam Newland, who served more than 20 years in the Army, offered the prayer at both Lyndon and Vassar cemeteries. A member of American Legion Post 317, Melvern, carries a wreath of flowers to be cast into the lake in honor of past sacrifices. 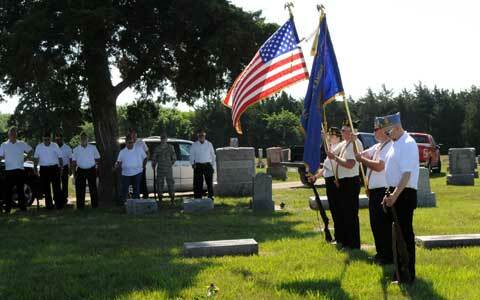 During the flag presentations at Vassar Cemetery, is another tradition that started at a young age. The nephew of David Ogle, Derek Hunt, has collected spent rounds every year but one to honor his uncle. He started this at age 6 at the first Memorial Day after his uncle died. 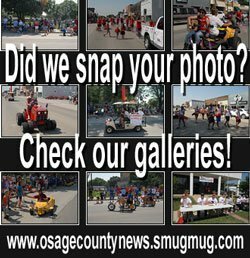 Pomona Dam where local posts (Post 125, Post 198 Osage City and Post 317 Melvern) show their camaraderie, when they come together for a Memorial Day presentation on the Pomona dam tower. This year, Micah Bryant of Mt. Pleasant Church offered the prayer. All involved hope to continue these traditions with younger members and their families for many more years to come. Members of American Legion Post 125 stand together at Lyndon Cemetery in solemn reflection and remembrance of their fallen comrades.